This is a set of two Pro-Line Shockwave 3.8" Tires, premounted on black F-11 17mm Monster Truck Wheels. These wheels are intended for use on the front and rear of the Traxxas T-Maxx and E-Revo, as well as other Monster Trucks with 17mm hexes that need an OEM size tire. 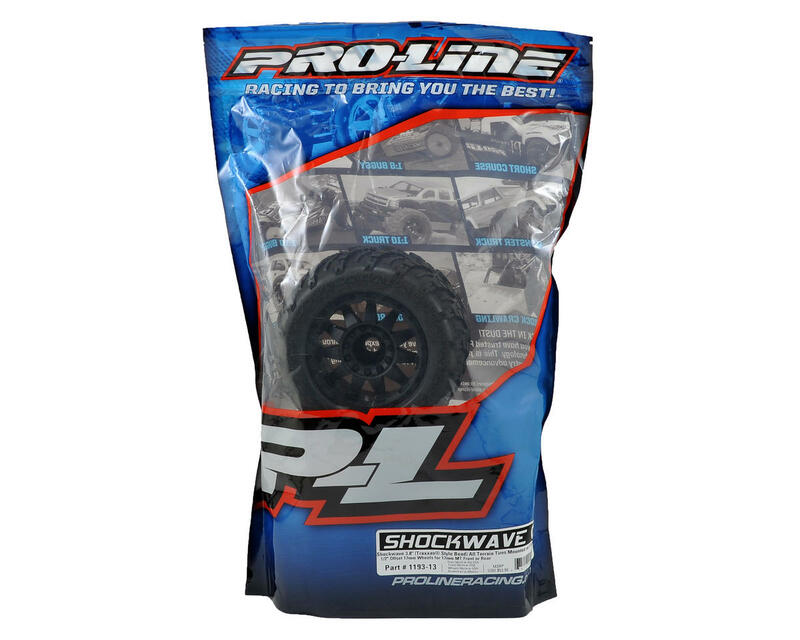 The Shockwave 3.8” tire is a lightweight Monster Truck tire that is the same overall size as the Stock Traxxas Talon tires but has way more traction. The Shockwave has a futuristic V-Style tread that improves handling and performance on the Street, Dirt, Grass or any terrain you want to go. This tire is perfect for the guys that like a nimble handling truck or are going for high-speed runs and don’t want their tires turning into balloons or pizza cutters. The Shockwave also features unique sidewall lettering and logo design that stands out enhances the look of your Truck. 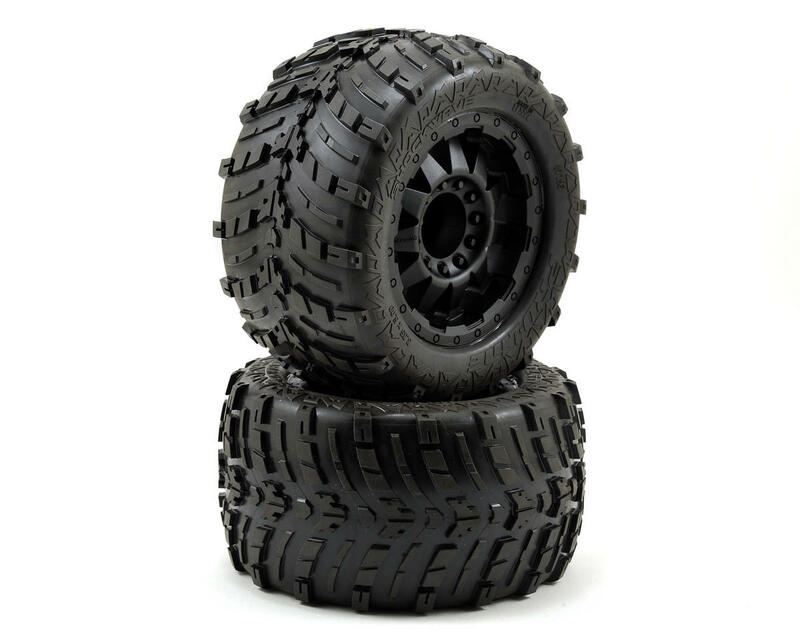 The Shockwave 3.8” tires are mounted on F-11 Black wheels. Pro-Line has an updated wheel for all of the Monster Truck fans: the F-11 3.8” ½” Offset 17mm wheel! The F-11 is a super-tough 11-Spoke wheel designed to mimic the look of full-size Off-Road Trucks! Pro-Line’s F-11 wheel features scale bolt head details and a swept back face that will stand out from the crowd of boring wheels. This wheel will accept all Pro-Line 3.8" Traxxas Style Bead tires along with all Stock Traxxas 3.8" tires, giving you a ton of rubber options. This 17mm hex wheel is sure to make your truck stand out from the rest, so get some today! ... on my E-revo, far better than stock Talon tires..